My real life menu & list from this week. In college, I could walk through ALDI and fill a cardboard box with the same $10 worth of food each week. How I ate on this I can’t remember; I must’ve been deficient in several vitamins. Since then food prices have roughly doubled and my number of mouths to feed has quadrupled. And it turns out not everyone can eat oatmeal, peanut butter, and potatoes every day (if they don’t have to). This group very much includes my husband and son. In Cut Your Grocery Bill in Half we made a case for shopping at discount grocery stores. But the temptation with these stores is to impulse purchase lots of goodies you don’t really need. Turns out buying twice as much at half price equals no savings. Whether you’re new to discount shopping or just want to slim down your already-discount grocery budget, here are some helpful principles for taking grocery savings to the next level. Make a menu. 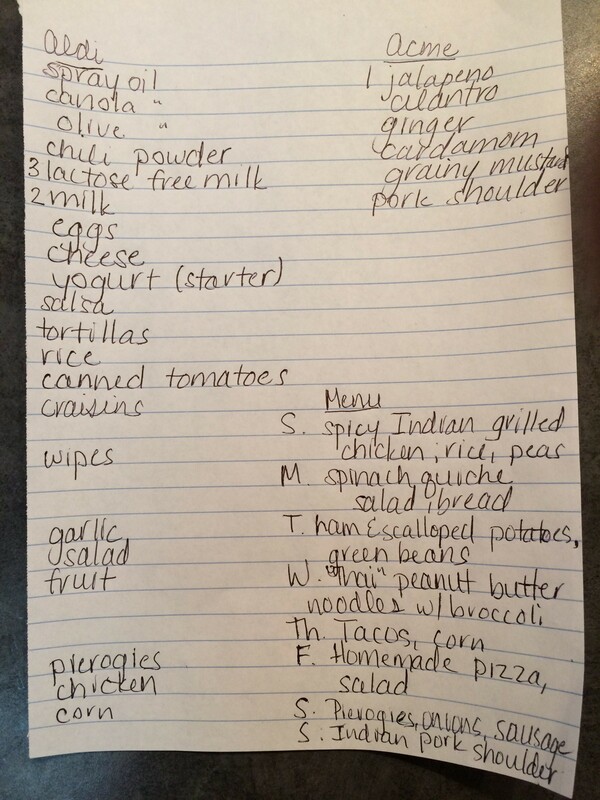 Especially if you have a family, creating a weekly menu can streamline grocery shopping. You’re less likely to purchase items you don’t need or make multiple trips, which can easily increase spending. If you have no idea where to start, there are services like e-meals that charge a small fee and provide meal plans and shopping lists based on different dietary needs or grocery stores’ weekly sales. I’ve never used a service but it would save money compared to shopping without a plan. Bookmark recipes and refer to them when you make a list. Add one new recipe per week. It often costs extra to add a new dish to your repertoire so take it one at a time. 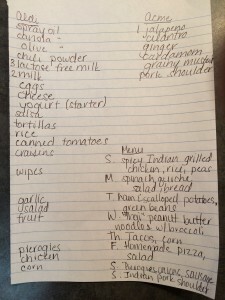 Use “pantry list” type recipes that mainly use staples you keep on hand. Follow a pattern. We have a Thursday taco night tradition. You might also follow a general pattern like meatless Monday or leftovers on Friday. Plan 3-5 dinners and eat leftovers or pantry meals. Start with a simple menu. Planning ahead will get easier and you can save old shopping lists and menu plans to reuse next month. Make a list. Based on your menu, make a comprehensive list. Look at each meal and write down the ingredients you don’t already have. Then check your pantry list and see what staples you need to replenish. This may include breakfast and lunch foods, baking supplies, spices, or condiments. Establish a pantry. What’s this pantry list I keep talking about? It’s the staples you need to make your favorite meals, and for the thrifty shopper this will include ingredients that allow you to buy less processed food. I’ll share mine soon. Buy real food. While you don’t need to adopt a totally different diet, buying less processed foods is a great way to save. You may have heard that all the real foods are around the perimeter of the store, while all the aisles in the middle are processed foods you don’t really need. There’s some truth to this. Real food is more filling and nutritious, and therefore a better value than cheap junk. Buy in-season. As much as possible, I try to buy in-season fruits and vegetables as these tend to be tastier, less expensive, and sometimes local. In the summer we have also have a garden, raise chickens, and do some canning. We’ll share more on this when the weather warms up. Stock up. When there is a good sale, if the budget allows, stock up! Just don’t burn through it faster because you have more. Shop at ethnic markets. Love dishes from other cuisines? One way to save on dining or take-out from ethnic restaurants is to invest in the basic ingredients and make your own. These ingredients are less expensive and often more authentic (and delicious) when purchased at a local ethnic market. Ideally, go with a friend from the country of choice for insider info. Since running around to the Indian, Asian, and Middle Eastern markets each week isn’t feasible, apply principle #6. A note on my list & menu above: this week I’m trying some Indian food from a cookbook I received for Christmas. All I needed were a few spices and the best way to get these at the local Big Store is in the bulk section. There you can buy a small amount so it doesn’t get stale, and is much cheaper (per pound and also because you can buy less) than the pre-packaged options in the spice aisle. Put food in perspective. This is perhaps the most important grocery shopping principle of all. Americans seem to have evolved from the SPAM generation into a bunch of foodies. While we love good food and the social milieu of breaking bread with others, it’s helpful to remember food is primarily about survival. Accepting that not every meal needs to be gourmet goes a long way in cutting food costs. That being said, I’m off to start dinner. What are your meal planning tips and tricks? This is so fun Kalie! The tip on adding one new recipe a week is great because I find I am cooking my families favorites more often! I like Krieger’s for produce, especially when it’s apple season! Their prices are great and so is the quality. It also feels good to support a more local less huge business. While I agree that food is primarily for survival, like you note it’s also an important aspect of our culture for other reasons. There have been countless times when others picked a restaurant that I didn’t care for or thought “I can buy 100 of these chicken fingers at Aldi for this price”! But the conversation and time spent are worth a few extra dollars. If you’re going to spurge, a dinner party at home is still way cheaper than eating out. I know this was a blog about grocery shipping and eating out is another topic, but there’s all kinds of tips for dining out like pre-eating which is my favorite. I think this is also a big key to grocery shopping – never go shopping hungry! Another idea which I employ is to allow myself one “frivolous” purchase like a bag of Clancy’s Sweet Potato Chips (right by the door) to just get it outta my system! I agree that shopping at local produce and farmer’s markets is a great way to save and get better quality. Thanks for mentioning the ultimate shopping tip–not to go hungry! I think I forgot this because I am a terrible person when hungry, and thus should never do anything hungry, if possible. Planning is a critical psychological principle for exercise, diet, etc. that people ignore because it’s no fun. Intentions are a good predictor of behavior. But if you have no intentions (e.g., no plan) then you just buy whatever looks good at teh time. I think we underestimate how effective the marketing people are; they’ve spend millions designing stores to promote the purchase of high-margin items. The only defense is to have a list. Also, Americans throw away a huge amount of food. If bagged spinach is buy-one, get-one free that’s still money down the drain when it sits in the fridge for 2 weeks because you had no reason to buy it and don’t eat it. If you plan a menu you buy less–it’s that simple. Great post! Thanks for stopping by our site. I just thought I would check yours out as well. These are great tips! Another major thing I would suggest would be to grow at least a portion of your own food. Try and grow the three food types: protein, carbohydrate and fat. For us these main staples are chicken eggs, breadfruit and coconuts/avocados. And of course eat lots and lots of fruits and veggies that are easy to grow in your area (for us these are many including bananas, mangoes, starfruit, basil, peppers, lettuce, etc). If you live in a temperate climate for perennials (easy, long term food) I could go with asparagus, horseradish, rhubarb, a strawberry bed, raspberries, and fruit trees (like peaches, apples, pears, cherries). You can even get dwarf varieties or 5-in-1 trees (meaning you could have like 5 varieties of apple on the same tree) if space is limited. For annual beds start with the easy stuff like radishes, lettuce, tomatoes, peppers, melons and you will be hooked to try more. It is so satisfying to grow and eat your own food! Way cheaper, way healthier and way more fun than going into a grocery store! Oh and raising chicken hens is a breeze and so much fun too! And the eggs are incredible! Thanks for checking us out. Sounds like you live somewhere much warmer than us! Growing food is very gratifying and we are looking forward to sharing more about it when it warms up here. Sounds like you have a great system for what to grow! Great ideas. I love the idea about processed foods. Not only do I feel better when I avoid the center of the store but it’s healthier, too. But OH HOW I LOVE Hamburger Helper (running joke in our family). I think putting food in perspective is a great tip. Scrambled eggs are served kinda regularly for supper at our house. It’s interesting though because good food is actually pretty important to a good life, so we’re actually considering spending more on food this year to add more variety. New commenter, liking the site! Thanks for checking us out! Creativity and resourcefulness go a long way in stretching the budget. While we like simple go-to meals, the family also loves variety. We actually eat like kings on our conservative grocery budget. I have really enjoyed these last two blogs about saving money at the market! Can you also put some breakfast and lunch ideas out there as well? Besides oatmeal and peanut butter, you mean? I really do eat those most days. But yes, we’ll have more food savings blogs to come. I havent gotten to read the first half of this topic, so hopefully these are not redundant ideas… A few more ideas are buying in bulk and buying locally, and cutting out a little or a lot of animal products. Buying produce locally is much like buying seasonally, you can get fresher food that will last longer and taste better. Certain produce (that hasnt been picked prematurely or spent weeks or more in refrigeration) can last in storage most of the winter months. Time travel back in history for your zone and look for recipes from before there was grocery stores and refrigeration. Seasonal menu changes help prevent boredom with the same old thing every day. Without too much thought it might be easy to say “I don’t want to eat the same thing all the time, who needs that 50lbs sack rice…” Buying in bulk doesnt have to translate to as much. For a little more initial investment and some proper storage its not hard to easily more than triple your money, what other investments can do that? There are a few restaurant supply stores that specialize in this sort of thing and don’t charge any membership (gfs in the Akron area). Some things are not practical (like a gallon of nacho cheese dip), but dry goods (spices to wheat/ bread flour and frozen goods) can be stored long term ( ie 5 gallon restaurant pickle buckets) and can be healthful staples if integrated into daily routines rather than buying premade bread or uncle bens rice (pick up a rice cooker or bread machine if you are short on time). Simply filling all the space you can in your freezer will save with your power bill, as the machine doesn’t lose all the cold air every time the door is opened when it is full of frozen blueberries. If you stand the idea of eating plain rice everyday go to your used book store or library and check out some other cultures cook books. You could eat a different style of rice or flour produce for 5 years without repeating the same thing. Great ideas. Thanks for taking the time to share them! It has been atleast two years since I stopped buying frozen dinners and I can’t say I miss them. Junk like pop (soda, for the confused), chips and those individually wrapped cakes were largely cut out of my diet over ten years ago. I just looked at them one day and asked “Why?”. @jere: Not sure if there are any advantages or not to a rice cooker but I cook all my rice on the stove top. For basic long grain rice it’s one part rice to two parts water in a pot. Heat the rice and water to a boil, stir and then reduce to low and cover for 20 minutes. Once that time is up remove from heat, sit covered for five minutes and then fluff with a fork. Done.